Marcus Rashford has the potential to "set the world alight" and could use the World Cup to showcase his talent, says England team-mate Ashley Young. Manchester United forward Rashford, 20, is in Gareth Southgate's squad with club-mate Young, for the tournament which begins on 14 June. "It's the World Cup and it could be his stage to show everybody how far he's come since his debut," said Young, 32. "He produces at United and will be a major player for us at the World Cup." Rashford became the youngest English player to score on his international debut in 2016. 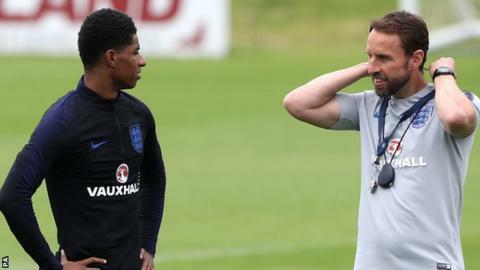 He has featured in his country's past eight fixtures under Southgate, who has chosen the third-youngest squad England have sent to a World Cup. "He's going to cope really well," Young added. "I've said it from the time I saw him in the youth team - he's got a massive future ahead of him. He's a fantastic player and if he keeps going the way he is, he'll set the world alight. "If you look at the goals he has scored on how many different debuts, it just shows he steps up in the big games." Only Young, Chelsea defender Gary Cahill and Leicester striker Jamie Vardy are over 30 in England's squad, which does not contain a player to have won a game at a World Cup. Young's inclusion comes despite him not being involved in the squad during the qualifying campaign. He ended four years out of the international set-up when he featured in November's friendly draw with Brazil. In his time away from England, he has adapted to a change in role after switching from winger to wing-back at Old Trafford. He was in impressive form last season, playing in 38 United matches, but he says that, despite his versatility, he "would rather be attacking than defending". Young said: "I don't pretend, I still see myself as an attacker, especially the way that we play with the full-backs or wing-backs high up. "Different managers play different formations. I think I am one of those players who has a good footballing brain. Wherever the manager calls on me to play I will give 100% for the England shirt and go to do as well as I can." England are preparing for friendlies against Nigeria at Wembley on Saturday and Costa Rica at Leeds United's Elland Road ground five days later. Southgate's side will then play their first World Cup game against Tunisia on 18 June, four days after the tournament begins in Russia. Cahill believes England's youthful squad possesses more experience than age suggests as a result of players' club exploits and Young insists the "togetherness" Southgate has harnessed should not be underestimated. "The squad can achieve as much as it wants to achieve," said Young. "We've got a fantastic group of players here; some exciting players who can change games in a moment. "Going into the tournament, we're full of confidence, especially with the friendlies we've played against some of the best teams in the world. We've mixed it against them and I think there's definitely going to be a good tournament from this England squad. "When we eventually get out to Russia, the togetherness and team spirit we have shown so far will take us a long way in the tournament."